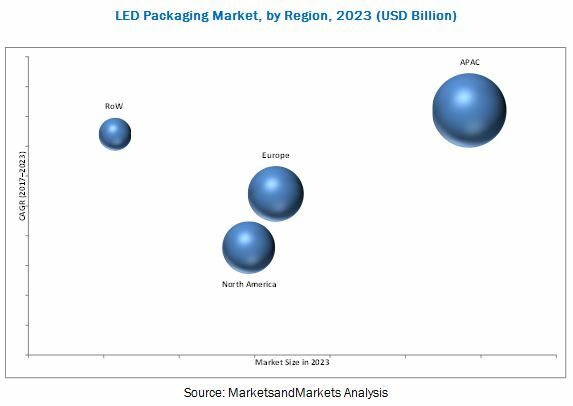 [159 Pages Report] The LED packaging market was valued at USD 17.08 billion in 2016 and is expected to reach USD 26.39 billion by 2023, at a CAGR of 6.2% during the forecast period. The base year considered for the study is 2016 and the forecast period is between 2017 and 2023. This report provides valuable insights on the ecosystem of the LED packaging market. The major players in the LED packaging market include Nichia (Japan), Samsung (South Korea), Osram (Germany), LG Innotek (South Korea), Cree (US), Lumileds (Netherlands), Seoul Semiconductor (South Korea), Stanley Electric (Japan), Everlight Electronics (Taiwan), Epistar (Taiwan), Toyoda Gosei (Japan), TT Electronics (UK), Kulicke and Soffa (Singapore), Dow Corning (US), and Citizen Electronics (Japan), among others. The global LED packaging market is projected to be valued at USD 26.39 Billion by 2023, at a CAGR of 6.2% from 2017 to 2023. The growth of the LED packaging market is expected to be driven by the increasing use of LEDs in various end-user industries such as automotive, backlighting, and other products. 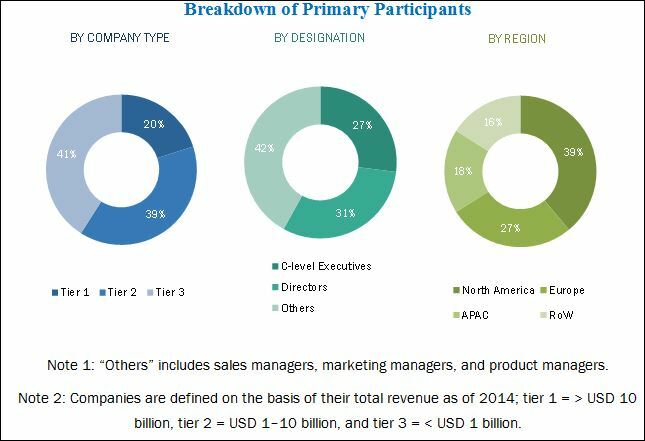 The major factors driving the growth of the LED packaging market include increasing demand for high power grade LED packages for lighting applications, rising demand for LED packages in the display panel market, growing government initiatives and regulations to adopt energy-efficient LEDs, and increasing demand for smart lighting solutions. The value chain of LED packaging market comprises R&D activity, original equipment manufacturers, system integrators, marketing and sales, and after-sale service. The LED packaging market is segmented on the basis of package type: surface mount device packages (SMD), chip on board package (COB), chip scale package (CSP), and others. Currently, the market is dominated by SMD packaging LEDs; however, the market for CSP LEDs is expected to register the highest growth rate during the forecast period. Increased adoption of chip scale package is mainly due to its advantages, such as reduced package footprint, thin profile, reduced weight, better electrical performance, and area array distribution of connections, over SMD packages. The LED packaging market is further segmented on the basis of packaging material: lead frames, substrate, ceramic packages, bonding wire, encapsulation resin, and other packaging materials. The substrates accounted as the largest segment in terms of materials used for packaging LEDs in 2016. Also, this segment is projected to witness growth at the highest CAGR during the forecast period. The factor that drives the market for substrates is the high power density of devices. The market for encapsulation resins is driven by the increased use of silicon material offering better reliability/lifetime than traditional epoxy materials. LEDs are used in various applications such as general lighting, automotive lighting, backlighting, and others. LED packages in the general lighting application are expected to have the largest market size due to the growth in residential lighting and industrial lighting applications. The potential to save energy on a large scale is the major factor for the growth of LEDs used for general lighting applications. The market for the industrial lighting application is estimated to grow at the highest rate and is expected to drive the LED packaging market due to the increasing demand of LEDs for various industrial applications such as industrial bay areas, cold storage areas, and other functional areas. Of all the regions, APAC dominates the LED packaging market The rising demand for LEDs in this region is mainly driven by increased adoption rate and government incentives. Europe is estimated as the second-largest LED packaging markets across the world. The market in this region is mainly driven by growing opportunities for the automotive industry. High saturation in the market is expected to restrict adoption, which, in turn, may limit market growth to a certain extent. The global market for LED packaging is witnessing high growth rate owing to a large number of players and is dominated by experienced market players. Companies are continuously focusing on R&D and are filing many patents related to different LED technologies. In 2016, the major players in LED packaging market included Nichia Corporation (Japan), Samsung (South Korea), Osram Licht AG (Germany), LG Innotek (South Korea), Cree, Inc. (US), Lumileds Holding B.V. (Netherlands), Seoul Semiconductor Co., Ltd (South Korea), Stanley Electric Co., Ltd. (Japan), Everlight Electronics Co., Ltd. (Taiwan), Epistar Corporation (Taiwan), Toyoda Gosei Co., Ltd. (Japan), TT Electronics plc (UK), Kulicke and Soffa Industries, Inc. (Singapore), Dow Corning Corporation (US), and Citizen Electronics Co., Ltd (Japan), among others.